Alertable is an iOS and Android app which offers users public emergency alerts, linked to Canada’s Alert Ready system. The goal of the app is to provide users who receive emergency alerts from authorities, plus more information and background on what is happening. The service is free for users on mobile and the web, along with Alertable’s Twitter and Facebook pages. But Canadian municipalities looking to implement Alertable will require to pay a monthly fee to participate (sending drinking water advisories are free, however). Calgary-based Rick Arter from Alertable, explained to iPhone in Canada they have been working closely with the roll out team of Canada’s Alert Ready wireless emergency system. His colleague, Jacob Westfall, sat on the CRTC wireless emergency alerting public awareness working group. Arter says PEASI is their overall alerting solution but Alertable is their new lightweight product designed for municipalities, a partnership between his company AKA, and NetAlerts. The provinces of Alberta and Saskatchewan have used the PEASI alerting solution for years now. As for Alertable, which launched back in early February? Interest is growing for the alerting solution, as “a number of municipalities are now assessing it now,” explained Arter. Alertable for iOS is an interesting emergency alerting solution because “Out of the box, it comes already connected to Canada’s public alerting system, so users can still get alerts issued for their area by federal or provincial agencies authorized to use AlertReady, even if their local municipality had not yet signed up to our Alertable service yet (to issue more local level alerts),” says Arter. 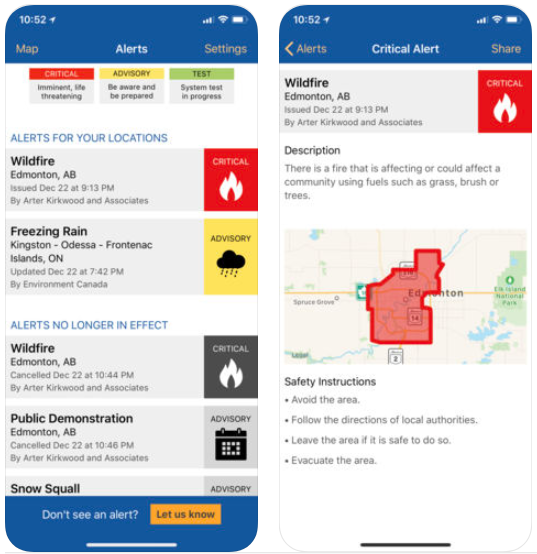 Alertable can send emergency alerts in both English and French, while the app itself meets both Federal and Provincial accessibility guidelines. If you have an older smartphone that does not support LTE, or if you’re in an area outside of LTE coverage but still want to get Canada’s Alert Ready emergency alerts, Alertable will notify you, since the app connects through a data connection or Wi-Fi. The Alertable iOS app supports iPhone X and has a simple and easy to use interface. Users just select cities they want to follow and alerts are listed in the main screen and alerts also include map coverage. There’s also a feature to ‘follow’ you feature to alert you wherever you go, away from your chosen areas. 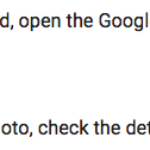 Update: Here are screenshots of what an emergency wireless alert would look like, within Alertable. The app would be handy if you wanted to stay notified of emergency alerts in areas where your children are visiting on a school trip, etc. Click here to download Alertable for iOS in the App Store.